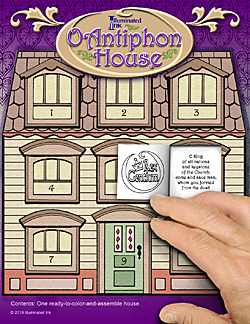 The “O Antiphon House” is calling Jesus to be home with us. Each of the first seven windows depicts one O Antiphon and a symbol for that title of Jesus. The last two windows build on the O Antiphons and transition from Advent into the Christmas Season. Open each window on the day shown and color the picture.